Don't know what I can say about that.. Dumbfounded really. Some people just seem to be able to say more about me than myself! How amazing is that? Recently I flew with a colleague who was so SURE that I was married -- I swear it was as if she was trying to convince me that I did have the wedding! She then mentioned the wedding card at the notice board during our time at the lounge -- one that ironically said "Hazwani & Khairul".. or something like that. I remember laughing at the card when I saw it. But it was NOT an invitation to MY wedding. Nope. Okay, I doubt anyone would confuse me with this Wani person. Still, it made me laugh when I saw this copy of Sinar at the news stand last year. Then last week, one of my favourite supervisors attempted to confirm with me that I was married too. 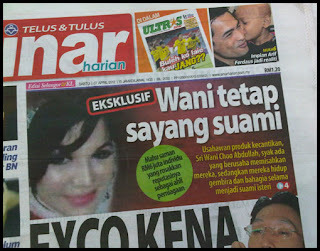 Well, he got the wrong "Wanie".. the person he was referring to was actually Syazwani -- which isn't even called Wani by our peers! Like, seriously. Then he commented, "couldn't believe someone as wacky had gotten married.." thinking if I had truly got hitched. Whatever that means. I'm not meant to get married? ooh? So anyway, today during the first hour of my flight.. One of my crew, which happened to be an acquaintance (one that I've known since my earlier days in the company and have actually seen outside the company time) did something pretty odd. At the time, I was sitting and my left palm was facing up on my lap. So this steward just grabbed my hand and flipped it so the top of my hand was facing up. He looked at my fingers for a moment and gave a small nod. WHAT - THE - HECK?! How is it that a LOT of people thinks I'm married?? OYYY!! It is quite disturbing, to be honest. For one, if I am married and still behave the way that I do.. Man, I'm a bad bad wife! hahahhaha! Or have I been acting like a married woman?? Damn, now I feel old. Thank you, people. So, NO.. I am not married. I'm pretty sure I would've nagged how I hate planning a wedding in here first. The idea of marriage still makes me laugh, to be honest. Poor Encem, I can never take him seriously. Perhaps I'll stop laughing once he actually say something to my father. Sigh. I wonder if I'll ever be ready for marriage... I don't think I am right now. I just hope no one will ask me if I am married anytime soon, because I have a feeling I might blow up if someone does.